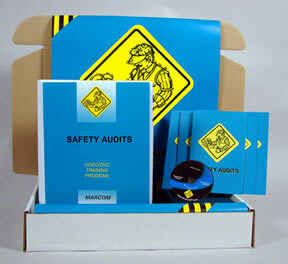 Description: MARCOM's ''Safety Audits'' Safety Meeting Kit™ informs employees about the goals of a Safety Audit, and how all workers should become involved. A single workplace accident can be devastating. Someone can be injured... or even killed. Property, equipment or materials can be damaged or destroyed. And work could come to a complete stand-still. All of these things can happen if efforts are not made to protect employees. One way to accomplish this is to conduct a Safety Audit. This is an examination of the work area to make sure it is as safe as possible and all potential hazards are corrected or removed. Materials in the Kit include a Videotape Program, five motivational Posters, and 30 Employee Booklets. The Posters in the Kit reminds employees of the importance of a Safety Audit. The Videotape and the Employee Booklets include information on a workplace analysis, administrative controls, engineering controls, personal protective equipment, emergency response procedures, regulatory compliance and safety/health training, accident investigation, a safety self-assessment, and more. The Videotape Program in the Kit comes with a comprehensive Leader's Guide, reproducible Scheduling & Attendance Form, Employee Quiz, Training Log and Training Certificate.